Until I watched the local news yesterday morning, the most important thing on my docket was recovering from my company Halloween party, where Julia was a swirling-dervish-modern fairy. My body ached from chasing her between the eighty or so other children at the Havas held party, around the bowls of candy, hot dogs, cotton candy, fresh popped corn, face painting station, cookie decorating tables, and the very-popular balloon artist. 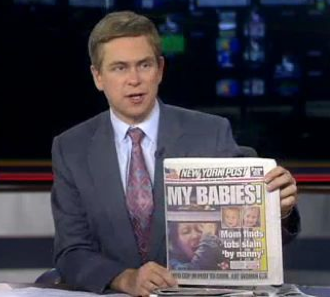 The unspeakable discovery from In the News on NY1. Since becoming a mom, I lost the ability to listen to what I call “and then the baby broke” stories. Tales of babies tossed from building windows, found among heaps of garbage, or on coroners’ tables with bruises on their bodys. But this story jumped on to me, and into me so fast, I was in its grip before I knew it. So I watched the whirling red lights of the cop cars and EMT squad haphazardly parked in front of the luxury high-rise building, a section of town that rarely saw such sights. I wept hot tears upon learning the mother’s screams could be heard beyond the building, perhaps beyond the block. The reporter moved on to the next story in the queue, the storm+hurricane+typhoon closing in on the mainland of United States. I stayed behind with photo of Marina Krim, the mom, her fists knotted, face contorted in shock, carried off to the hospital for sedation and care, a woman who had taken her middle child to her swim class that day, thus saving the child’s life. Every day, parents take the lives of their children. Kids that serve as bloody pawns in divorce cases, the victims of their parents bad days at work, absorbing their parents’ frustrations with their small bodies, until they no longer can. Until they break. Or until their parent drives them into a lake strapped into their car seats. Sad as it is, stories of moms taking their children out in Greek Tragedy Medea fashion are not rare. But the act of murder committed by the person selected to carry for one’s children, in my twenty plus years of living in New York City, is. It is beyond my understanding. I cannot manage it because my nanny is vital to my life. Emotionally and monetarily. And Julia’s. Without my nanny I cannot work, I cannot make money to care for Julia. To care for myself. Everyday, across America, millions of women like me head to work not because they want to, but because they have to, for their economic survival. According to NBC News American parents kiss 63 million children goodbye and leave them with an adult they must trust. “Did you hear about the nanny killing the kids?” my nanny asked this morning, minutes after she came through the door. I nodded, as my eyes clouded over like a rain-soaked windshield. I turned away to fold a crumpled blanket on Julia’s bed, to hide. “I can’t image what that mom is going through this morning,” I said, but thinking Angie is braver than I am. I had not planned to broach the subject. “I heard on the news that the husband was away on business in California and returned last night. The cops went to the airport to meet him,” Angie said. She had come to work well-informed, ready to discuss the matter. Possibly because she learned of the story Thursday night, perhaps because of the bravery factor. Pehaps because she is a nanny. “ I know, I know,” I said, but my face became streaked with hot tears anyway. We embraced. It wasn’t exact a hug, it was more the solidification of a bond, an oath, given to one another. I trust you. I believe in us. By this time Julia had toddled into the kitchen, to see what the commotion was all about. Angie and I scooped her up into our arms, our collective circle of trust and love, trying to work some faith of the order of things back into the gray mournful day. But in the back of my mind I knew, in kitchens across New York City, another kind of talk was brewing. Talk between husbands and wives. Talk of budgets, and in flow and out flow, of line items and needs. Talk of how the family could live on one salary, how they could live on less, and have greater peace of mind.